Note: Schooner rigged; boilers in hull. 30" x 10', 300hp engine, Pittsburgh, PA. Boilers built Pittsburgh; 27' wheels with 12' buckets. 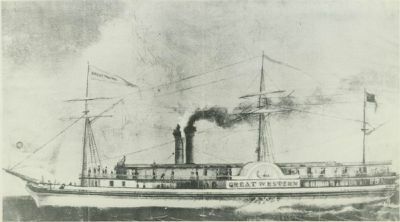 1838 Enrolled Sandusky; first steamer above Lake Ontario with upper cabins. 1839 Ran for Western Transportation Co.
1839, Sep Burned, Lake St. Clair; extinguished, reignited at Detroit; rebuilt. 1840 Ran Buffalo, NY - Chicago, IL. 1840, Oct 26 Stranded St.Clair flats near Detroit. 1843 Carried over 550 passengers. 1843, Aug Collided with steamer COLUMBUS off Ashtabula. 1844, Jan 15 Collision with WISCONSIN, Buffalo Harbor. 1844, May Aground Manitou Islands, Lake Michigan. 1845, Nov Damaged in storm near Point Abino. 1846 - 47 Laid up, St. Clair River; overhauled. 1846, Nov 19 Grounded, Detroit River. 1848, Nov 30 Driven onto dock, Buffalo. 1849, Apr 21 Owned Chancy H. Whitaker & Co., Buffalo. 1850, Apr 30 Owned Capt. Kingman. 1851 Ran Buffalo - Cleveland, OH. 1852, Jul 29 Collided with schooner J. W. BROWN off Buffalo.